Plumbers always need their vans to be fully functional. And since they also have to carry around a large quantity of spare parts and materials in addition to their tools and equipment, they need to store everything securely and in a dedicated space, ready for immediate use. The van illustrated on this page has exactly what it takes. 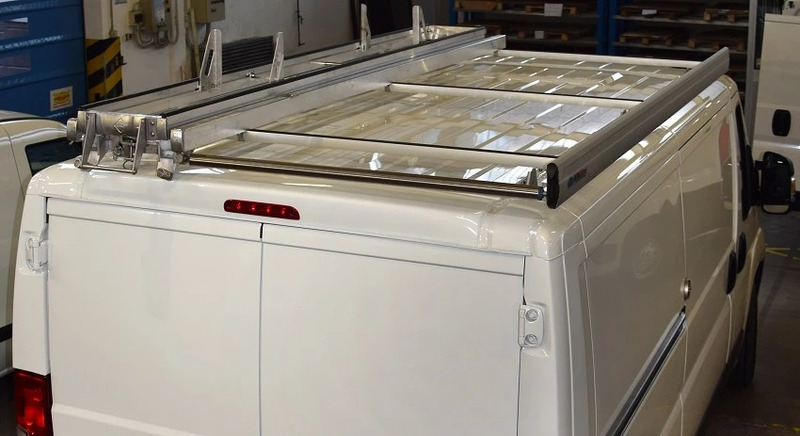 The racking in this plumber’s Citroen Jumper was designed by Syncro System to ensure an exact match for the customer’s needs. The following paragraphs describe the solution in greater detail. 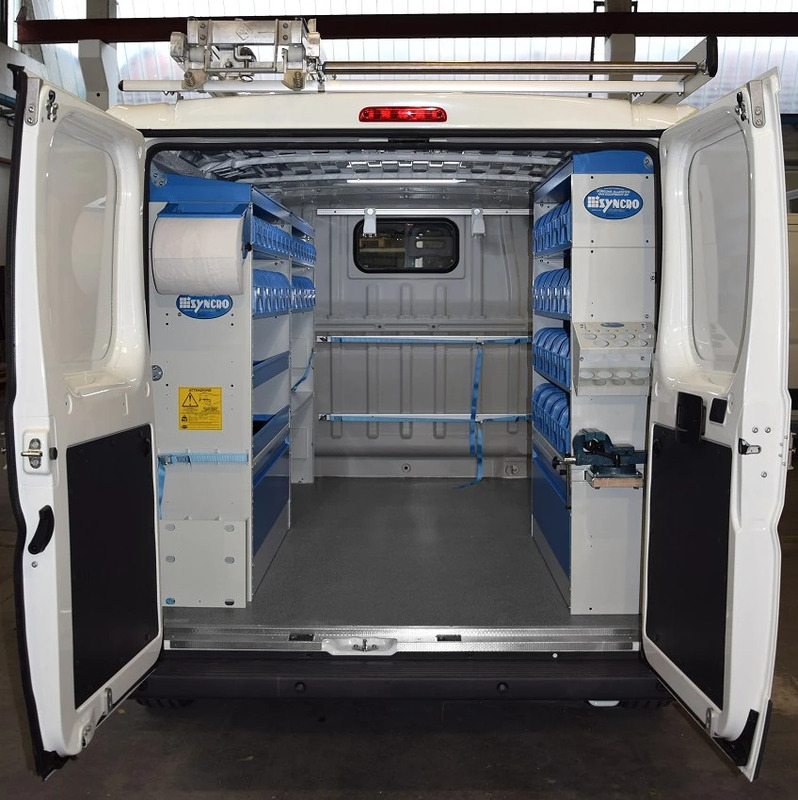 If you use your van as a mobile workshop and stores, you inevitably climb in and out of the back umpteen times a day, often with wet or muddy shoes. This subjects the floor to wear from your own movements and from the water you carry in. To avoid the floor damage caused by normal daily use, this plumber’s Jumper has been fitted with a marble-look birch plywood liner. A clean appearance at all times, thanks to two factors: the attractive finish, with a pattern of dots in different shades of grey, and the ease with which the flat surface can be cleaned. The racking in this plumber’s Jumper extends along both side walls, with two columns on the left and one on the right. As can be seen, much of the storage space is provided by removable plastic containers, carried in shelves with specially made holes to prevent movement during transport. 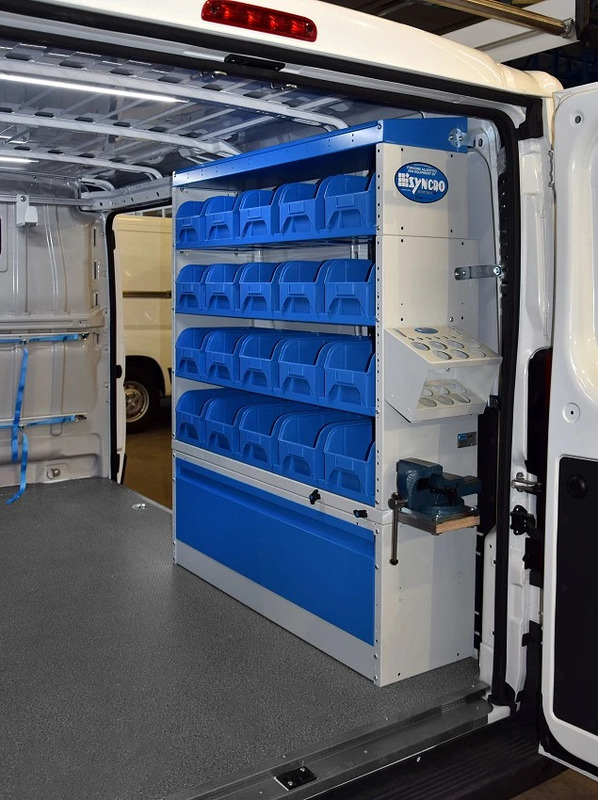 This particular van boasts a total of 30 large plastic containers and 16 smaller ones. Left side: The first column provides floor level storage in the form of a wheel arch cabinet with a bottom profile and a parallelogram action door. Above this are two open shelves and another two carrying plastic containers. The bottom and central sections of the next column are both dedicated to case transport, but use different retaining systems. 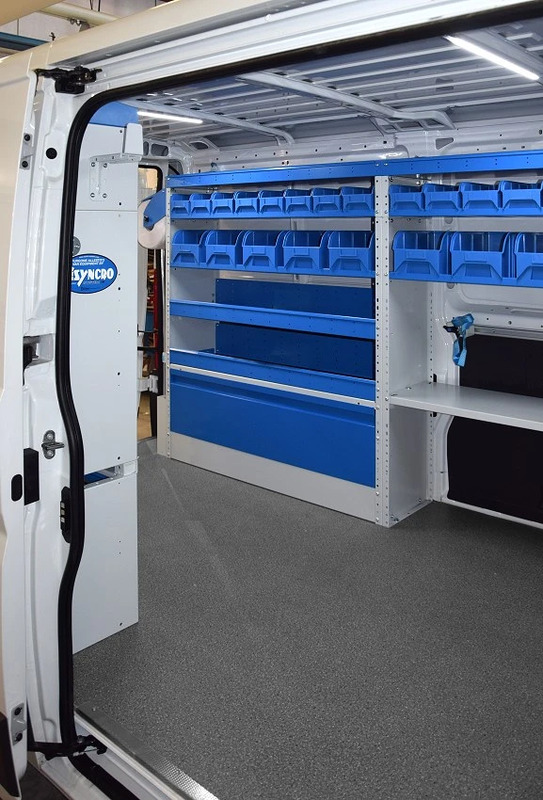 The compartment at floor level is fitted with a sliding shuttle and ratchet locking system while the higher compartment uses a metal bar, hook and strap system. Above these are two shelves of removable containers. The highest level in the left side racking is a top shelf that extends over both columns. Right side: The racking here consists of a single column. The closed wheel arch cabinet and first shelf of removable containers sandwiches a pull-out vice bench. Another 3 shelves of containers complete this column up to the top shelf. 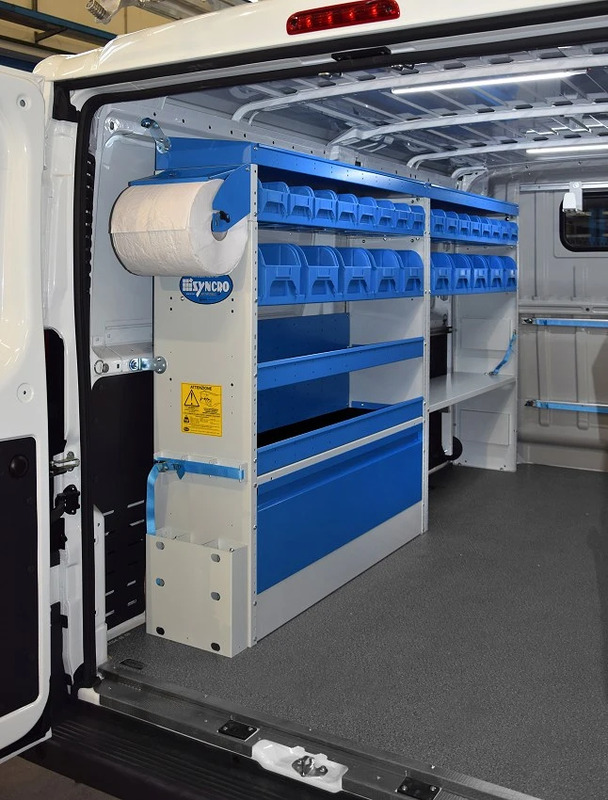 As with most Syncro racking installations, a number of accessories have been installed to make the van more functional. A bar rack with retaining straps is fitted to the back of the left side racking, at the bottom. A paper roll holder is also fitted at the back of the left racking, further up. A silicone tube rack with holes for nozzles is to be seen at the back of the right side racking, just above the pull-out vice bench. The top of the bulkhead and the end of the racking near the side door are fitted with metal bars with adjustable hooks. The bulkhead is also fitted with two bar, hook and strap retaining systems for heavy and bulky cargo. Last but certainly not least, this plumber’s Jumper has been fitted with an Ultrasilent roof transport system consisting of three cross-bars, side fences and a rear loading roller, plus a single slide ladder rack on the left.